Hi everyone! As you've probably heard (So Near, and Yet So Far), we need another $4000 to cover the costs of cleaning, upgrading, replacing, etc all of our cams for the next nesting season. 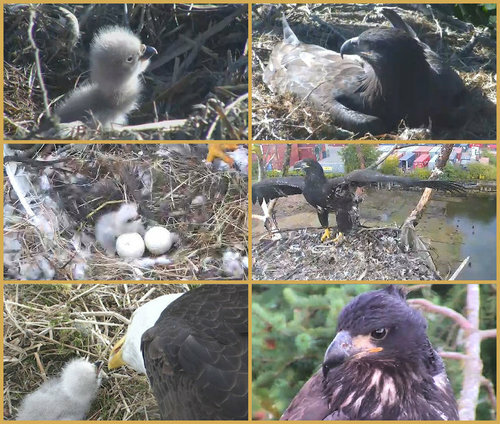 We'd like to add a second cam with night vision at Delta, sound at Harrison Mills, more bandwidth at Lafarge - and it would be nice if eagles nested successfully at White Rock, though that is a bit beyond our ability to organize. But the rest is possible, if we have the funds. However, that's not the only reason we need money. It costs in the neighborhood of $30,000/year to keep our website, forum, and cams physically streaming to the internet. Part of that is included in the cost for each cam - but that $30,000 per year also covers the expenses of our forum and website, and the media gallery - and a whole lot of photos that have been uploaded over the last few years for everyone to enjoy.
? ~ ~ ~ ~ ~ please ~ ~ ~ ~ ~ ? I used this image below (which clicks bigger) last year (with a few changes - my avatar in the lower right corner is now Birdie from Harrison Mills - almost ready to fledge!) - but the message is still the same. There are now lots of cams on lots of nests all around the world - and lots of places and ways to gather to discuss what's happening at your favorite cams - and to paraphrase what forum member terrytvgal says so eloquently in her signature line - I'm here because of the friends I've made. 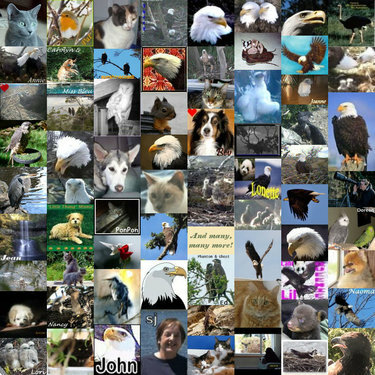 I think perhaps I'm not alone in finding the forum and website a great source of information about eagles and other wildlife - and a great place to chat with like-minded individuals who also are amazed at what we can see on the cams. We moved to this new forum at the beginning of 2010 - a bit over 3-1/2 years ago - and there are already over half a million posts here! 1383 people have posted at least once, 750 have posted 5 or more times, 234 have posted more than a hundred times - and 87 of us have posted more than a thousand times! I know that many of you have already donated - and I would like to thank you again for your support! You're the greatest! And if you are one of the other 700+ people who have posted several times - please consider making a donation in support of the costs of maintaining the forum, website and other infrastructure. We're encouraging people to use CanadaHelps to make their donations - you'll get a receipt almost instantly, and it saves HWF valuable time and resources. And you don't need to be in Canada to use CanadaHelps - just click the blue button! Or you can choose one of our other Five Easy Ways to Donate. And we do know that financial donations aren't the best way for everyone to contribute - so I'd like to take a moment here to also thank those who help out on the forum and website, and those who watch and control the cams and report and take s'caps and make videos - and make this the educational resource it was meant to be, and those who keep things running smoothly on Facebook and the various chat threads and all sorts of places that I'm only now learning about, and our content providers who add a whole 'nother level to the data on our forum by reporting on an amazing variety of wildlife. Thank you all, from the bottom of my heart. And thank you all on behalf of Hancock Wildlife Foundation - it's you who make this such a marvelous resource. Please donate now so we can see what the next year will bring. Credits: Thanks to cococat9 for the s'cap of Feathers ready to fly; to IrishEyes for the s'cap of tiny Birdie being fed; to mjb for the s'cap of almost-ready-to-fly Birdie looking thoughtful; and to all the zoomers who make s'caps like this possible (the other s'caps are mine); thanks to terrytvgal for her signature quote "I came for the eagles, and stayed for the friends I made"; and thanks to the 69 members whose avatars I used for the collage - and I wish I could have found a way to use them all.